The main goal of this course is to focus on techniques that FQHCs can use to help with staff recruitment. Recruiting competent and engaged staff is a common problem at FQHCs, but successful FQHCs are adept at finding ways to get candidates interested in working at their organization. This course covers recruiting all potential staff, not simply providers of care. You will review some of the most prominent HRSA-related programs that can assist FQHCs with this process. Using interactive vignettes, you will apply your knowledge and arm yourself with the most useful resources available to help you recruit and retain your employees. 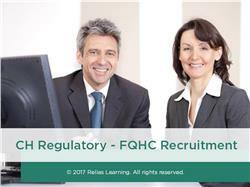 Recognize 2 key character traits that fit the FQHC model for potential employees. Describe the top 2 aspects of working at an FQHC that fuel employees’ passions. Identify 3 collaborators for recruiting potential employees. Name 2 recruiting collaborators available to Health Centers. Instructor: David P. Wagner, M.H.C.M. David P. Wagner, M.H.C.M. is a fiscal and administrative specialist for HRSA in the Operational Site Visit Review process, as well as a provider of technical assistance to Health Centers through his own firm FQHC Consultants, Inc. Mr. Wagner has his Master's degree in Health Care Management. He brings with him a wealth of experience in all areas of Health Center operations, including clinical operations, finance, billing and collections, governance, administration, quality improvement, strategic planning, service coordination, as well as contracting and direct provision. Mr. Wagner has over 30 years of experience in operations of Health Centers including presenting on numerous topics for state and national primary care associations, thereby assisting Health Centers in remaining compliant with program requirements and sustaining operations. Disclosure: David P. Wagner, M.H.C.M. has declared that no conflict of interest, Relevant Financial Relationship or Relevant Non-Financial Relationship exists.